What's the Deal with Cat Roundworm? Cat roundworm infestation, while common, is usually less severe than other types of worms in cats. Cats that roam outdoors and are allowed to hunt are more susceptible to infection. Since felines can become infected with roundworms by contact with contaminated soil or eating infected prey, keeping cats indoors is a recommended precaution. The infection rate is very high in Kittens, with some sources claiming that almost all kittens are infected at some point. You should be aware that although most infestations are not severe, an untreated case in a kitten could result in death. 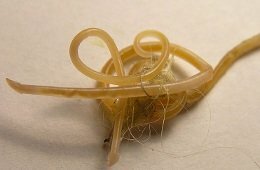 According to the Cornell Feline Health Center, roundworm (Toxascaris leonina and Toxocara cati) are the most common of the feline intestinal parasites. Estimated infection rates are 25% to 75% (higher in kittens). Adult roundworms are 3 to 5 inches long, and cream in color. Having relatively thin, tubular bodies, they resemble, of all things, strands of spaghetti. 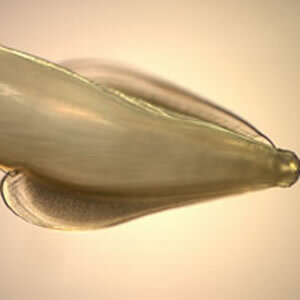 Unlike hookworms, roundworms do not attach themselves to the intestinal wall. They "swim" freely in the gut of the cat. Female roundworms produce fertile eggs that pass through the cat's intestines and out into the environment in the feces. The eggs are not immediately infective, taking several days to several weeks to develop into the infective larva stage. How does your cat become infested with this nasty beast? Ingesting infected tissue of a transport host. Consuming larvae passed through an infected queen's milk. Ingesting infective eggs - This can occur through direct (e.g. eating infected cat feces) or indirect (e.g. contaminated soil or plants) contact with roundworm eggs. Ingesting infected tissue of a transport host - By eating rodents, birds, or insects (transport hosts) that have larvae in their tissues, your cat may become infected with roundworm. Consuming larvae passed through an infected queen's milk - Kittens can contract the worms from their mothers and become infected by larvae that are passed through infected milk. It is therefore possible for kittens to become infected soon after birth. Note: this method of infection only applies to Toxocara cati, not Toxascaris leonina. Not that is matters to your kitty! It should be noted that a cat can appear perfectly healthy, and still have a mild case of roundworm. Even with a lack of symptoms, then, we should not assume that a cat is not infected! As compared to other intestinal parasites, roundworm infections are relatively benign. If there are enough worms present to cause intestinal blockage, however, it can become life-threatening. In addition, since kittens are small and still developing, infected kittens are in serious danger if left untreated. Older cats with other debilitating diseases or immune disorders can be at similar risk as well. If you have a kitten or older cat at home at risk, you should be certain to have discussion with your veterinarian about roundworm infestation and treatment. With mild infestations, you likely won't see any worms. Roundworms in cats are diagnosed by discovery of the eggs during microscopic examination of the stool. Sometimes more than one exam is needed in order to confirm the presence of the eggs. Occasionally, adult worms may be seen in the cat's vomit, or in the stool. Worms are a significant health issue for kitties. Be sure to get your cat tested at least yearly, even if s/he shows no symptoms. The good news is, that treatment is relatively easy, readily available, and inexpensive. The bad news is that treatment has to be administered several times, and only kills the adult form of the worm, not the larvae. The deworming medication will kill the worms and they will pass into the stool. Typically, at least two or three treatments will be needed, at 2-3 week intervals. Kittens are often dewormed with each visit for vaccinations. Your veterinarian is obviously the best judge of how treatment should be administered. Obviously, deworming queen's prior to pregnancy will control the kitten infestations. Prevention: The best recommendations for general prevention of parasites are restricting cats from roaming and hunting, and control of insect and rodent populations. Can you boost the immune system of your cat?